The Wizard of Oz is an American musical movie. It was produced by MGM and released by RKO in 1939. The movie is based on the children's book The Wonderful Wizard of Oz by L. Frank Baum. This book was first published in May 1900. The book and movie are about a little girl's adventures in the land called Oz. This is still watched from 1939 to 2017. The song "Over the Rainbow" won the Academy Award for Best Original Song. The movie was first televised in 1956. It became an annual Thanksgiving television special for many years. The movie was named the most-watched motion picture in history by the Library of Congress. In 1998, the movie was sixth on the American Film Institute's 100 Years... 100 Movies list. The movie has been chosen for preservation in the United States National Film Registry. 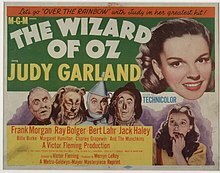 Dorothy (Judy Garland) lives on a drab Kansas farm with her Auntie Em and Uncle Henry (Clara Blandick and Charlie Grapewin). A powerful storm sweeps her away to the Land of Oz. She accidentally kills a wicked witch. She wants to go home, but only the Wizard of Oz (Frank Morgan) can send her home. She must go to the Emerald City to see him. She sets off on the Yellow Brick Road wearing the witch's ruby slippers. She makes three friends on the road: a Scarecrow, a Tin Man, and a Cowardly Lion (Ray Bolger, Jack Haley, and Bert Lahr). On the way to Emerald City, the friends are tormented by The Wicked Witch of the West (Margaret Hamilton). She is the sister of the witch Dorothy killed. She wants the ruby slippers. Dorothy won't give the slippers to the witch. The friends arrive in Emerald City. The Wizard sends them off to kill the witch. The friends are captured by the witch. Dorothy throws a pail of water over the witch. The witch melts. In the Emerald City, the four friends are welcomed as heroes. The Wizard prepares his hot air balloon to take Dorothy back to Kansas. The balloon takes off without her. A good witch called Glinda (Billie Burke) tells Dorothy she can go home by just clicking the heels of the ruby slippers together and thinking about home. She does this. She wakes up in her bed. Her adventures have been a dream.